IRVINE, CA--(Marketwire - October 19, 2010) - Project Insight, project management software provider, announces its selection by National Western Life Insurance (NWL) for the organization's project management needs. National Western Life is a thriving life insurance company with a growing number of information technology (IT) projects. Previously, projects were managed with whiteboards and with spreadsheets, making it difficult to assess the financial impact of projects on the organization. The IT team which runs projects did not have visibility into its resource management needs. There was no efficient process for delivering project schedules on time and within budget. The project team, which included internal and external project members, did not have a good method for capturing all time spent on projects. After a formal evaluation of ten project systems, Project Insight, online project management software, was chosen. National Western Life values Project Insight's easy to use, centralized, online project management abilities, effective resource allocation and useful financial portfolio reports. Plus, the Project Insight team also provides personalized support and training which gives the customer the knowledge they need. 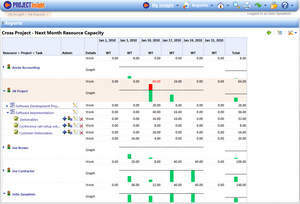 Project Insight was used for a major system upgrade project. To date, this project already has over 150 team members entering time and over 110,000 hours logged against it. Now, the chief accounting officer has access to real-time project and portfolio financial information, and is able to capitalize and expense project costs accurately. Project Insight, web-based project management software, is powerful for project managers, easy for everyone. Project Insight offers three editions for flexible, scalable project management, hosted Workgroup, Professional and Enterprise. An on-premise option is available with the Enterprise edition. Project Insight supports Internet Explorer, Firefox and Safari browsers. Microsoft Outlook Connector, Office Connector add-ons and a mobile interface are offered. Project Insight project management software supports The Project Management Institute, Inc.'s (PMI) standards, and is compliant with the PMBOK® Guide. Project Insight and Metafuse are registered trademarks of Metafuse, Inc.